Early Booking Offer – Book early and save up to 40% off the room rate. Please contact us for further details. One&Only Royal Mirage, Dubai is a breathtaking hotel that encompasses all things Arabic; mosaic tiles, domes and arches grace this truly magnificent hotel. This alluring property makes the heart beat, as you explore the majestic beauty and surrender yourself to ultimate relaxation. Ordained with Emirati rich touches, the interiors are lavish yet subtle. Guest rooms are the epitome of comfort. Rich in texture and fabric, terracotta tiles and custom made furniture creates a blissful abode. Relaxing mornings can be spent on the balcony, where you can gaze at the lush gardens and take in the copious beauty. This hotel focuses on relaxation; casually stroll around and let the sound of gentle waterfalls and streams fill your ears and the softness and lushness of the grass amaze you. There will never be a moment where guests sit ravenous at One&Only Royal Mirage, each restaurant has many feasting choices and dining is a plentiful affair. Unwinding pool side or by the ample beach will make memorable days and the Arabian sunset warming your soul, making unforgettable evenings. Early Booking Offer – Book early and save up to 40% off the room rate. A well being retreat that provides reinvigorating and soothing massages, and treatments that are both traditional and contemporary. 12 treatments rooms are beautifully decorated and are so serene that you can hear a pin drop. The Moroccan Oriental Hammam is an authentic experience that must be tried. Leave the spa cleansed, relaxed and energised. The Hair and Nail Salon is great for being pampered. Take time away from the pool or from exploring Dubai and indulge in a treatment or two to spoil you. Tennis – Three floodlit tennis courts for an evening game, as the dewy Arabian sunset heat cools. Watersports – with a private stretch of beach overlooking the Gulf, there are plenty of motorised and non motorised water activities for your enjoyment. Pools – 4 sparkling swimming pools lay across the hotel. Flourished with palm trees, guests are in a tropical refuge as they lounge by the pool. Kids Club – The Kids Club organises a range of activities for the younger One & Only guests; to keep them entertained throughout their stay. Fitness Centre – The latest gym equipment and free weights are available. For professional one-on-one guidance, get a personal trainer to help you along the way. Kasbar – Vibrant in colour and spirited in style, Kasbar is set on three floors; each an entertaining and lively time. The Rooftop – A chic and cultured stop, the Rooftop is an unbelievably beautiful place to enjoy some special moments. Refreshing beverages are served at this effervescent bar. The Jetty Lounge – located pool side, this chill out bar is an easy, relaxed time. Colourful drinks are served at this hip venue. One&Only Royal Mirage, Dubai is an exotic hotel that overflows in Arabian beauty. The terracotta building in addition to the domes and arches are architecturally fabulous and honeymooners are welcomed to an Arabian styled palace. One&Only Royal Mirage is flush with flourishing gardens that are flawlessly manicured, only further emphasised by the mellow waterfalls and soothing streams. Stealing intimate moments as you stroll through the property are easily done and you and your loved one can get lost in this tropical paradise. 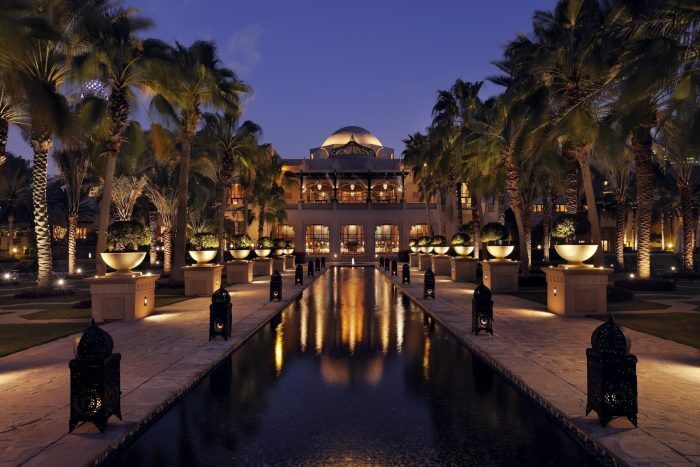 One&Only Royal Mirage is located on Al Sufouh Road, Jumeirah Beach, Dubai 37252 U.A.E. There are many choices available for dining at the One&Only Royal Mirage and the hotel has split the restaurants into the distinct areas: – Arabian Court, The Palace and the Residence and Spa. Olives – Dining indoor or outdoor, Olives offers Mediterranean light bites that are wholesome and homely. Tagine – Moroccan flavours and spices create enticing dishes in tagines. Full in taste, ripe in colour, each mouthful will be scrumptious. Beach Bar and Grill – Seafood and grills, served with delectable sauces. Grilled to perfection, fine cuts of meat are served with appetizing salads and wonderful sides. The Dining Room – A discreet and intimate dining affair is served up at the Dining Room. Each dish is created with passion and comes recommended if the beef Tenderloin.